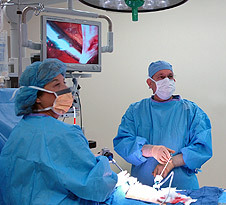 Surgeons at United Regional have been performing minimally invasive surgeries for several years. However, when we learned that individuals in our community had to travel to large metropolitan areas to receive a more advanced type of minimally invasive surgery – robotic-assisted – we concluded that the da Vinci Robotic Surgical System would be a wise investment. The da Vinci® Robotic Surgical System is the most advanced robotic laparoscopic technology available anywhere in the world today for gynecologic, prostate, hernia repair, mouth cancer and other types of surgical procedures, and, you can get it right here in Wichita Falls at the hands of our highly skilled surgeons at United Regional. The da Vinci robot cannot make decisions or movements on its own; rather, it combines the skill of the surgeon with the precision of the robot to deliver more exact moves than possible through the human hand alone. With this new technology, even major surgeries can be performed through the smallest of incisions. United Regional Health Care System is the exclusive facility in the region with this advanced robotic technology.